There is a special mystique to Girl Scout Cookies; part of that is due to the fact that you can only buy Girl Scout Cookies once a year and you can only get them from cute little girls in brown (Brownies), green (Junior Girl Scouts) or khaki (Girl Scouts) uniforms. If you're a life-long Girl Scout fan like me, you can still find the "Celebrate Scouting Stamps", which are Forever (current first class postage) stamps from USPS. The stamp was issued in 2012 in celebration of the 100th Girl Scout Anniversary. Under Juliette Gordon Low, the woman who brought the Girl Scouts to the United States, cookie sales began back in 1917 to help finance troop activities. At that time, the cookies were homemade by the scouts. 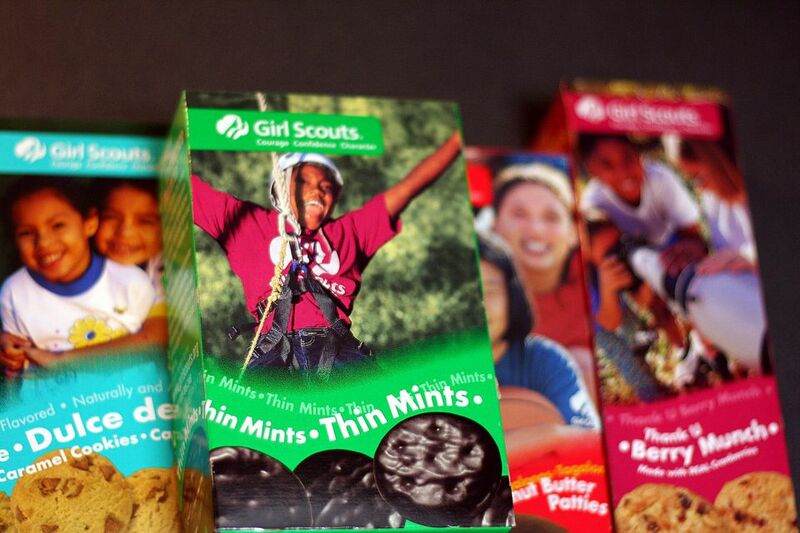 It wasn't until 1934 that Girl Scouts began selling commercially baked cookies. By 1937 there were 125 Girl Scout Councils nationwide selling cookies. Today there are over 300 councils selling cookies at different times all year long. Ever wondered why the same cookie may have two different names? The answer is simple; Girl Scout Cookies are baked in two different bakeries, ABC/Interbake Foods and Little Brownie Bakers. Although there are some differences you should always be able to find Thin Mints, Do-Si-Dos (Peanut Butter Sandwiches) and Trefoil (Shortbread) cookies. According to the Girl Scouts of the USA, Thin Mints are the favorite closely followed by Samoas®/Caramel deLites, then it's Peanut Butter Patties®/Tagalongs®, Peanut Butter Sandwich/Do-si-dos™ and then the rest. Chocolate Chip Shortbread - (gluten-free chocolate chip shortbread cookie) - 20 cookies* per 5 ounce box. Cranberry Citrus Crisps - (made with whole grain, cranberry bits and citrus flavor) - 20 cookies* per 6-ounce box. Do-Si-Dos™ - Peanut Butter Sandwiches - (peanut butter cookie with peanut butter filling) - 20 cookies* per 8-ounce box. Dulce de Leche - (made with milk caramel chips) - 15 cookies* per 6-ounce box. Lemonades™ (shortbread cookie with a tangy lemon icing) - 16 cookies* per 8.5-ounce box. Samoas® - Caramel deLites™ (vanilla cookies covered with caramel on top and bottom then rolled in coconut and striped with chocolate) - 15 cookies* per 7-ounce box. Savannah Smiles™ (crisp, zesty lemon cookies named in honor of the 100th anniversary of Girl Scouting) - 25 cookies per __ ounce box. Tagalongs® - Peanut Butter Patties® (Regular cookie with soft Peanut Butter and coated with chocolate) - 15 cookies* per 7-ounce box. Toffee-tastic™ - Gluten-free buttery cookie with crunchy golden toffee bits. Thank U Berry Munch (A cookie made with premium cranberries and white fudge chips.) - 14 cookies per 6.17-ounce box. Thin Mints (thin chocolate-peppermint cookie coated in chocolate) - 32 cookies* in a 10-ounce box. Trefoils - a.k.a. Shortbread - (a shortbread cookie) - 44 cookies* per 10 ounce box. * All cookie counts and package sizes are approximate. **Remember not all cookies are available is all areas. Cinna-Spins™ (crispy cinnamon snack swirls that come in 100 calorie packs.) - five .85oz. packs with net weight of 4.25oz. Lemon Chalet Cremes™ (rectangular cinnamon-ginger lemon-filled cookies) - 14 cookies* per 8 ounce box. Mango Crèmes with NutriFusion™ - (vanilla and coconut cookies filled with a tangy mango-flavored creme enhanced with nutrients derived from fruits) - approximately 21 cookies per box. Reduced Fat Daisy Go Rounds™ (crispy cinnamon cookies) - 5 servings* per 4.2-ounce box. Shout Outs!™ (Light and crisp, Belgian-style caramelized cookies) - 40 cookies* per 9-ounce box. Sugar-Free Chocolate Chips (chocolate chip cookies) - 15 cookies* per 5.5-ounce box.